January | 2014 | Another Beautiful Day in Paradise! Never a dull moment around Casa Poolman. Mrs. P and I have been spending most of the past two days at a local hospital. Our daughter, Writer Princess, had been feeling bad for the past week, and had seen her primary care doc twice. She was feeling much worse on Thursday evening. So we (Son-in-law included, of course) trekked to the emergency room. It turns out she had an infection and needed to be admitted for two days of IV antibiotic therapy. By the time the docs figured that out, we had spent the entire night in the ER waiting room. If you have not had the pleasure of such an experience, this is one you can take off your bucket list. It appears that healthy-living is not high on the priority list for most of the majority of ER patients. Most had figures similar to my cat, Sid, a Manx. When we first got Sid, I remember reading that you could draw a Manx cat by just using a series of circles. The same could be said of the people we spent Thursday night with. I think it is true what they say, that hospitals are the worst place to go when you are sick. A woman came in and sat near me. Every couple of minutes she tried to cough up a lung, and then hung her head between her legs and moaned, “Oh Lawdy, oh Lawdy.” If I saw her on the street, I would take her to the hospital. But we were already there. What to do? Actually, what I did was to move across the room to avoid her droplets. The big party in WP’s room. I didn’t realize hospitals were so popular. I know that insurance companies want the hospitals to move the patients through and get them out the door as quickly as possible. So I was very surprised that WP had to wait several hours in the ER before being transferred to a room…because there was not am empty bed in the house. Really? What am I missing? This does not look like it’s the hot spot in town. So it’s Saturday afternoon and WP is a little past the half-way point of her 48 hours of IV therapy. 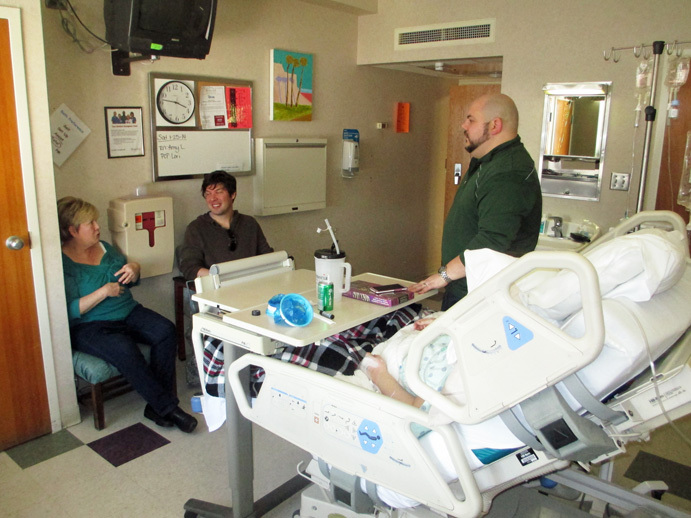 We are working shifts with Son-In-Law to keep someone at the hospital all the time. We’re still looking around for the party that is keeping this place filled. Haven’t found it yet. We have been adopted. It’s official, or at least as official as a cat-adoption can be. As I mentioned in an earlier post, a stray/abandoned/homeless black male cat started hanging around our house a day or two before Christmas. After we ascertained that the cat was definitely not the neighbor’s cat, which we originally thought, Mrs. P took him to the vet and had him checked out, shots, etc. If he wasn’t our cat before paying the $300+ vet bill, he sure was afterward. Since then, Zorro and Mrs. Poolman have developed quite the mutual admiration society. Mrs. P goes out to the garage to smoke. Zorro is frequently hanging out there anyway, but if not, he comes trotting through the pet door to the back yard and gets in Mrs. P’s lap. Neither of our “regular” cats will do this, and this has been a source of constant frustration to Mrs. P, who wants a “lapcat.” This Zorro knows who is buying his Friskies. Mrs. P and her new boyfriend. We had a close call last week. While I was on my way home from work, I got a call on my cell phone from an older woman who started off with “Oh, you are a real person, not a machine.” Huh? She told me she had a black cat that had disappeared a few weeks previously when she was in the hospital. She had been at the vet and picked up on one of the various “found cat” notices I had spread around a few weeks ago. She thought Zorro might actually be her “McPheron.” She came over to the house with her adult son. However, she couldn’t definitely ID the cat as hers. Also, on the phone, she could not ID two distinctive physical features of Zorro that she would definitely have recognized if he were her cat. Mrs. P was not at home at the time, so I was not very encouraging about letting her take off with Mrs. P’s new cat. That is, not unless the cat just jumped into her arms and started licking her face, which he most definitely did not do. So the cat came back…and stayed. During my career in TV news, I was fortunate, or unfortunate as the case may be, to be witness to all sorts of live, on-air screw ups. Many were funny, but some were not. But that it not the point of this post. In honor of all my friends and family who are digging out and trying to stay warm, here is a classic from my favorite radio news guy, Les Nessman. The cat came back! Good luck? We may have a new member of the Poolman family. It all started early last week when we heard a cat whining. Mrs. Poolman and I searched the house for one of our cats trapped in a closed bedroom or a closet but didn’t find one. But there on the front porch was this black cat crying to be fed. Of course we fed the poor thing. 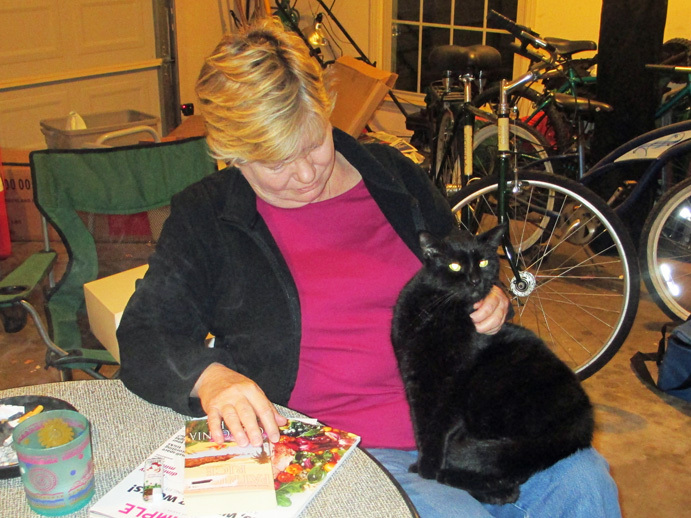 We thought the cat must be “Sophia,” a stray that had taken up with our next-door neighbor. (I know this sounds politically incorrect, but let’s face it, one solid, jet black cat looks pretty much like the next one, especially if it isn’t your cat.) The neighbors had vetted her and fed her, but otherwise she was an outside cat. They neighbors were away for the holidays, so we figured we would feed her until they got back. We also placed a beach towel in a plastic box for her to sleep in and stay out of the wind. Sophia stayed with us even after the neighbors returned which created some joking about us stealing their stray cat. Then the other night, Mr. Neighbor came over. Great! Just what we need — another cat. Upon closer examination, we also discovered that that cat we thought was “Sophia” was actually “Tom.” We don’t know if he is lost or was dumped. He is a very nice, friendly feline. He loves attention and will actually come when you call him, especially if he thinks food is involved. So we are looking for his real family. 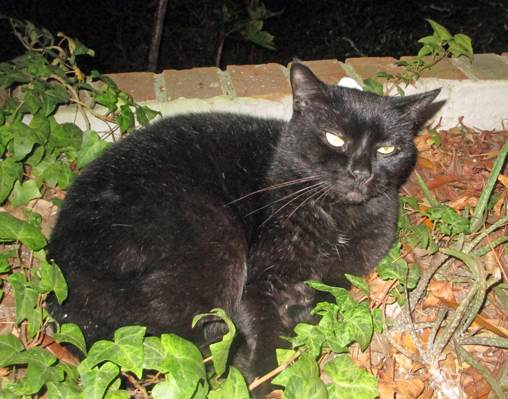 I have checked and posted “found cat” notices on several local pet sites. I think Mrs. P is going to take her to check on a microchip tomorrow. If we don’t find his home, I guess we will have a new “outside cat.” He still has his front claws. That rules him out as an inside cat in the Poolman household. (We have donated too many couches and chairs to the scratching pleasure of cats over the years. We are done with that.) However, we won’t just take him to a shelter, since we know, although he is a very sweet, friendly cat, the chances of an adult cat being adopted are very slim. I didn’t think we had a current job opening for a new cat, but I may have been wrong.